Type in this input field the letters on the tiles that you have in your rack. The order does not matter. If you have any wildmarks—tiles without a letter on them, which you can substitute with any letter—, introduce them as an asterisk *. Since there is a maximum of 7 letter tiles in the rack in each play turn, this is the maximum number of characters that should be typed in this box. 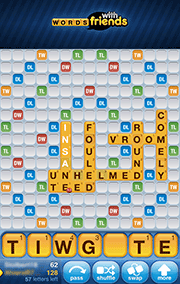 By providing a mask, you can find the words that you can form by combining your tiles with letters already on the game board. A mask indicates the letters already played, and the empty tile spaces where you can place your own letters. A mask is composed of letters—those already on the board—, dots . to mark a free tile space, and dashes - to indicate a series of free tile spaces where as many letters as possible can be placed. -O.. to find words that contain an “O” followed by up to 2 letters, and preceded with as many letters as letters as possible. -O...E.. to find words that contain both an “O” and an “E” separated by 3 letters, followed by up to 2 letters, and preceded by as many letters as possible. Note that the dots between the letters given in the mask become mandatory positions that must be filled with your letters tiles. -WARD. to find words that contain “WARD”, preceded with as many letters as possible, and followed by a single, optional letter. A dash - is the same as many dots . together. Type a dash when there is enough space to place many letters, so that you don’t have to type a dot for each free tile space. Once you run your search, results will be presented in two or three tabs—depending on whether you also provide a mask or not. This tab will contain the list of words that you can form with your letters and, if you provided a mask, also satisfy the mask. If you provide a mask with your search, this tab will become visible and will list the words that you can form with just your letters, ignoring the mask. This is just to avoid having to run a new search when going back and forward considering the next word to play. 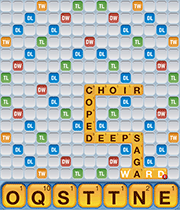 Here you will find words that you can form combining your letters with one additional letter. If there is a high scoring word that you’d like to play, see if the necessary letter has already been played on the game board and you can use it to form the word. In both letters and combination searches, it is possible to filter the search results by a letter. Use this to limit the search results to those words that contain the selected letter, or that are formed by combining your letter tiles with a particular letter tile on the game board, respectively.